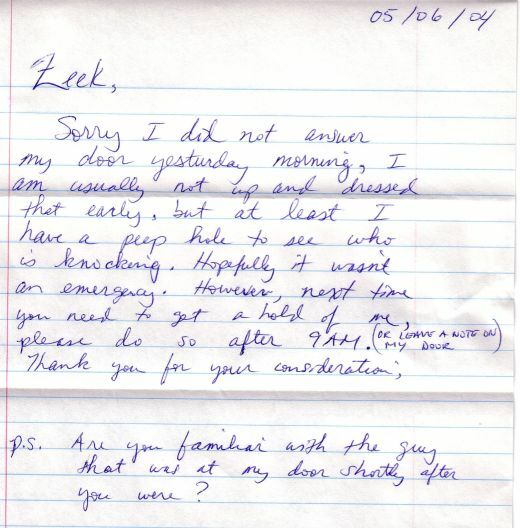 I don't recall ever knocking on your door, except once, and that was some time ago (had to do with asking if residents would like to sign a birthday card for elderly longterm resident, Leo). It is also not my habit to knock on anyone's door before 10am...unless agreement to do so has already been made. Is it possible someone else knocked on your door, then left...and you saw me in the hallway (entering bathroom), and assumed I was the person who knocked? The guy you refer to (who was at your door shortly after you saw me through peephole): I don't recall seeing anyone...but I wasn't paying any mind, either. I have my mind on a LOT of things every morning, because that is when I'm on my computer and the Interent...and I only take brief breaks to the restroom, before my day's work is over (around 2-3pm). So when I'm going down that hallway, my mind is most likely preocuppied with a msg. I'm writing, some research, or scanning for ideas and contacts. And I'm that way until I finally step out for coffee. Don't know what else to tell you, as I'm confused you thought I recently knocked on your door, at an early hour. P.S. : Bldg. Mgr. just let me know the details, and I now understand what happened. Very SORRY you experienced such rudeness in our building...and that the poltergeist of 6606 (being mischievous as they are by nature) found some new way to (try to) pull me, Chief Queer Exorcist--into a vortex of chaos, deceit, and psychic runoff.